Too bad I didn't read the Fringe Association post on incorporating a stitch pattern in a top down sweater. If nothing else, it may have spurred me to plan better. It probably would *not* have helped me deal with picked up stitches being a half stitch off, though. And that is the lie about the so-called invisible cast on. When one picks up the stitches from the cast on, to knit in the opposite direction, they will be a half stitch off. This probably does not show (much) when knitting stockinette or garter, but loudly shouts its existence when there is a stitch pattern involved. I tried several ways of finding satisfaction with the shoulders of my drop down sweater, but finally settled on knitting an inch or so of seed stitch across the top of the shoulders, to disguise the half stitch shift. Amazingly, I can fit my fat head through the neck hole! So. After deciding to knit my drop shoulder top down ski sweater in moss stitch... I started it in the large checks that I thought I did not like. And guess what - I was right, I do NOT like the large checks. So I started over, with the moss stitch. And guess what - I was wrong, I do NOT like the moss stitch. So I swatched again, this time using the ringwood stitch i previously used for a pair of gloves and a baby sweater. Now THIS I like! If you are ever knitting a sweater and find yourself thinking, It would be easier just to BUY a sweater, STOP and change something - the yarn, the needles, the pattern, SOMETHING. I was freaking out a bit about starting over for the third time, but I am so glad I did. While second guessing the stitch pattern, I was also second guessing the size. Fortunately, Fringe Association posted about measuring other sweaters as a guide for determining stitch counts. I piled up a bunch of store-bought sweaters but was not sure I liked what they were telling me. Then I pulled out a handknit sweater and tried it on, to determine the ease. Perfectly zero. I usually wear something fitted under this sweater and it works fine. Let's measure it. The next question is, How much ease do I want in my new sweater? Given swatching is a gamble and arithmetic is a lie, causing my sweaters to turn out larger than I plan, I am going to aim for zero ease on this sweater, with the expectation that some positive ease will magically appear. Perfectly logical, right? 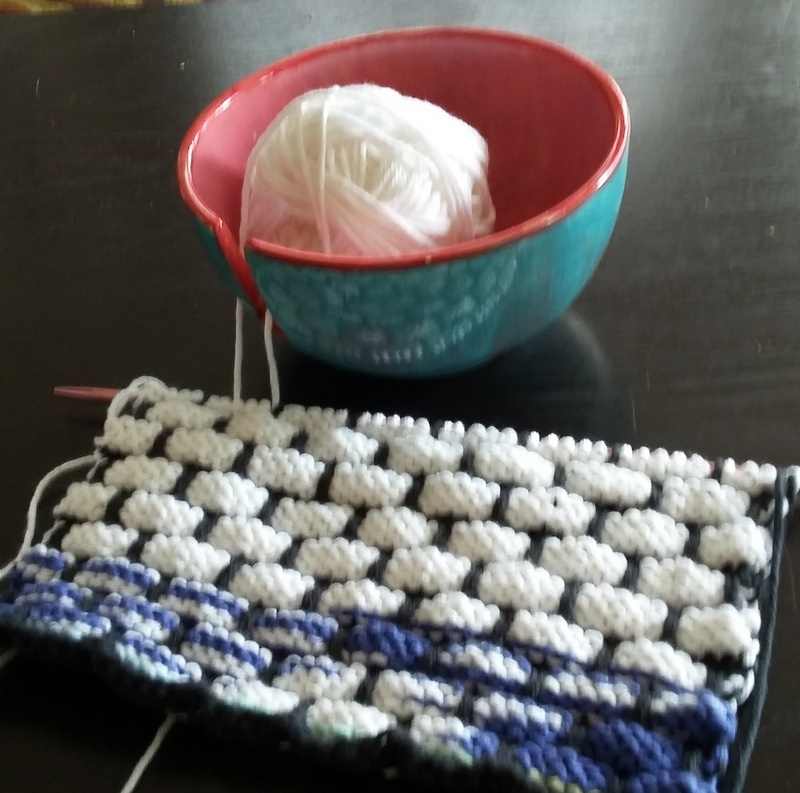 I was going for a baker's dozen (13), but when it came time to start one more ballband dishcloth, I just could not do it. So twelve is enough for this summer. There really isn't much to say about this stash-busting project other than I am glad it is over. Even though it is still August and hot, the light is shifting and autumn will be here before you know it. Time to return to wool. Here are the individual dishcloths, in case you want to see more detail. Not the ballband dishcloth (although I did make that). I'm talking about the yarn bowl. One blistering Saturday when we were tired of being cooped up in the house, my SO and I took my granddaughter to Bisque It Pottery. Nora had been to a pottery painting place before, but not one that also glazed and fired the pieces. Of course, she was "done" with hers in about five minutes. Mine took quite a bit longer. 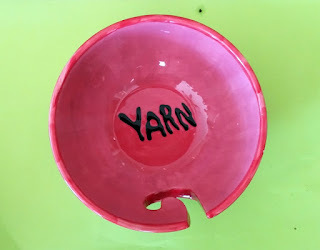 I usually work from center-pull balls of yarn, so don't really "get" yarn bowls. Yet it seemed like the logical choice for me. (SO painted a pencil holder.) Even though I put three coats on my piece, coverage was not as complete as I hoped. For a first time attempt, I think the result is okay, though. And it is handy for keeping a ball of yarn from wandering. Pottery painting is surprisingly soothing. (It might have been even more soothing without a five-year-old.) When Nora and I stopped to pick up our fired pieces, we scoped out all the other possibilities. I might do some dinnerware (dishwasher and microwave safe!) to continue to refine my skills. Then maybe some art for the garden? A knit-along is scheduled on Fringe Association. It's for knitting a sweater top down without a pattern (but with guidelines). I am not going to knit along, but maybe knit alongside. A sweater's worth of ruby yarn has been sitting in my stash, crying out to be a ski sweater. I plan to knit a drop shoulder (not raglan) sweater. I plan to knit top down (but not in the round). I am combining two patterns (not going patternless). Those three reasons are why I am not joining the KAL. But I would really like to complete this sweater before the snow flies. The KAL starts August 15. In preparation, I dug the yarn (Cascade 220 Superwash) out of the stash (no simple task), swatched a bit on US8 needles (too loose), switched to US7, then swatched a collection of stitch motifs from "Denmark" in the Ethnic Knitting Discovery: The Netherlands, Denmark, Norway, and the Andes. The stitch motifs are, from right to left: a bit of garter, stockinette, seed stitch, moss stitch (small checks), a 3x3 moss stitch (just to see what it looked like), checks (4x4), a bit that looks like basketweave (an accidental experiment), diagonals, seed-stitch triangles, solid triangles, 8-point rose all-over (yeah, I can't see it either), reverse stockinette, and some more garter. The sweater patterns calls for large checks and triangles, but I am not loving the checks. I'm leaning toward the moss stitch and seed-stitch triangles, with seed stitch edging. At least, that is how I feel today. The pattern in this book is for a drop shoulder pullover, knit from the bottom up. I plan to follow the instructions in Knitting from the Top for a Dropped Shoulder Ski Sweater, but not knit in the round. I have knit sweaters in the round before and they make me look like a barrel. Also, I tend to overestimate how big to make them, then am stuck with the size. If I knit the front and back flat, however, I could redo the side seams if I wanted to slim the sweater down. Theoretically. I also want the back welt to be longer than the front because I really plan to wear this sweater while cross country skiing and would like to not feel a breeze down the back of my pants.